As mentioned in my last post, here is my By Hand London Charlotte Skirt. It was inspired by this photo, and above I am wearing it with my Pin Tuck Alma. This is Variation 3, and it says on the pattern that you need 2 1/4 yards of fabric. I say - nonsense! 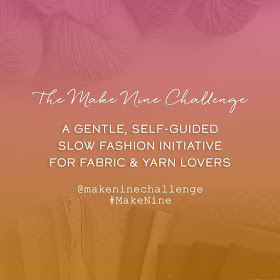 I made mine with 60" wide fabric that was 83cm long: so there! I did shorten it by 4.5 inches though. This was really easy to make, and made even easier by the sewalong on the By Hand London web site, which even tells you how to add a lining. The photo below is probably closest to the real colour. I'm not sure what the fabric is because it came from my Granny, I'm guessing it's gabardine. Whatever it is, it's nice and heavy. I love the double darts. But my favourite bit is the invisible zip. It really is invisible! I used the tutorial here on the By Hand London website - this is how I will be doing invisible zips from now on. 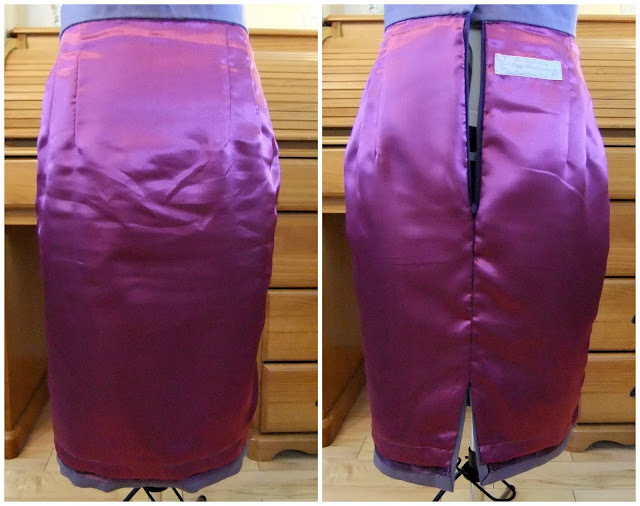 In this tutorial you put the zip in first, using an invisible zipper foot, then sew up the back seam using a normal zipper foot. 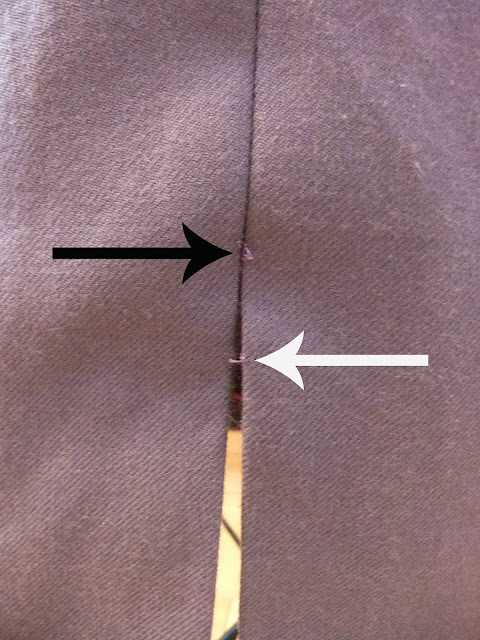 This was a bit of a revelation for me, because I had always sewed the seam first, but then got a weird ripple where the seam meets the bottom of the zip. Apologies for the creases, I'd been wearing it before I took the photos. My snazzy magenta purple lining is from Sew N Sew in Belfast, and I used some pop fasteners on the waistband. The pattern suggests leaving a 4 inch split at the back, so you can actually walk in it. I duly made a 4 inch split, but I heard the stitches pull as I was getting out of the car! In the photo below the white arrow is pointing to the top of the 4 inches, and the black arrow is where it stopped coming apart. So I'll have to fix it, and maybe do two rows of stitching to strengthen it a bit. This is a lovely pattern, the shape is so flattering, and it's very easy to make. 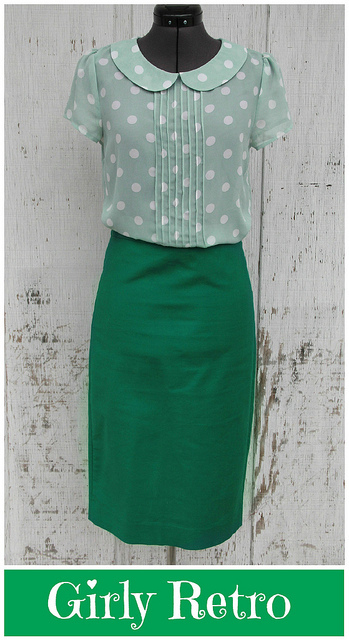 I can definitely see more Charlottes in my wardrobe, I'm thinking red and green. I love it. You've tempted me to buy the pattern. Thank you! Hope you love the pattern too. I love the lining you chose!! The skirt looks great! 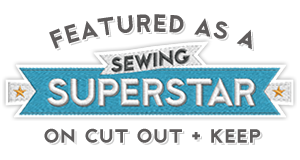 Are you knitting at all these days or is all your time taken up with sewing? Thank you! The only knitting I'm doing at the minute is the smoothie hats for The Big Knit, but this is because I've been working on my epic crocheted granny square blanket. It's nearly finished, so I must do a post about it. Thank you! Stabilising sounds like a good idea. Very slinky! Sorry about the ripping problem. You will have to practice your "swivel exit" from the car (keeping knees together like a 50's debutante! )I am tempted by this pattern but I know I wouldn't feel comfortable, so I had better be sensible and admire others from afar! Thank you! Yes, I'll have to practise my swivel out of the car! I'm usually leaping out of the car in a rush to do something else. Great skirt and love your lining choice. It is unfortunate about the ripped stitches but hopefully you'll sort that out. Interesting zip insertion, I've not come across that before. Thank you! This is, without doubt, the best zip I've ever done. It looks so professional! Oooo - gorgeous - it's so flattering on you! Is the lining sewing to the zip by machine or hand? It certainly looks v professional!!! Bummer about the slit ripping - I tend to try and put a kick-pleat in rather than a slit as it gives you more room to move and is a bit stronger. Sunni from A Fashionable Stitch has a good tut on how to add one to a pattern than doesn't have one. Thank you! The lining is attached to the zip by hand because that's how it was done on the sewalong! I think I remember seeing the tutorial about the kick pleats. I must have another look for it. Gorgeous! I love this on you-- you look killer! What a gorgeous skirt and the lining is a lovely colour. I often get that zip ripple, it's blooming annoying! Thank you! I can totally recommend this way of putting in invisible zips, I've done it twice now. Ripples are a thing of the past! Thank you! You're right on the vent vs slit, but I seem to have some weird, unexplainable prejudice against vents! This outfit looks fantastic! I've been thinking about getting this pattern, I have some linen with a good amount of stretch in it, do you think it would work with a stretch?? Thank you! Stretch linen would definitely work for this, and the stretch would make it easier to walk, and get in and out of a car, in. Good luck with it! Love this skirt, and especially love the colours! I'm inspired to try this myself, I often have waist to hip fitting probs so the only solution is to make my own so I'm really tempted to give this a go! Thank you! My skirt is a tiny bit big at the waist, but the hips fit perfectly. I had a look at your blog, and I love the inverted kick pleat, it's much nicer than a vent. I found the tutorial, thanks for the pointer! !